I hate the fact that this kind of violence, which kids are exposed to through the media constantly these days, creeps insidiously into their sleep, invading their dreams. The subliminal violence is everywhere. This same son, a 9th grader in a typical American public high school, is reading Lord of the Flies for English class and All Quiet on the Western Front for Social Studies. 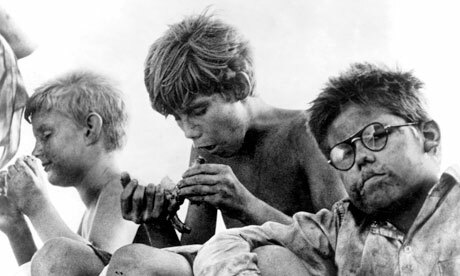 Lord of the Flies, you’ll remember, is about how a group of adolescent boys, turned loose on an island without any adult authority present, morph into “beasts” who bully, torture and kill one another. All Quiet on the Western Front is about World War I, and my son’s teacher is sparing the class none of the gory details of that war; in fact, a whole section of the paper my son has to write about the book is supposed to enumerate all the challenges ordinary soldiers in that war faced, from freezing muddy trenches to disease to field amputations, rats and artillery fire. Last month, this same teacher had the kids reading 1984 and spent a lot of class time talking about how the surveillance tactics and physical brutality in that book related to real-life episodes of torture and detention camps in the history of China and the Soviet Union. In short, my son’s imaginative life lately has been saturated with violence, for which the peacefulness of our home is no match. And he is one of the more sheltered boys growing up today; I do my best to keep him away from violent movies or military-style and gangster video games. We don’t even have TV at home. When dreams like this emerge at our breakfast table, they remind me that the apparent peacefulness of a small American town like mine is terribly fragile. With every mass-murder shooting incident that occurs, the fine veil of civility frays just a little more. The truth is that the United States has one of the most heavily armed civilian populations in the world. It would not take much, in terms of social unrest, for those guns to come out and the “beastly” side of humanity to emerge, a la Lord of the Flies. That’s what worries me when I contemplate climate change scenarios involving catastrophic storms like Haiyan that result in power outages, fuel and food shortages—which could happen here in the U.S. just as easily as anywhere else. What we should be doing now, in the time we have left before climate change gets truly out of hand, is strengthening our bonds as communities. Never mind the dysfunctionality of our Congress, the bashing and competitive trash-talking that too often passes for ordinary public discourse in America today. On the local level, we can do better, and indeed we must. Every community in America should be starting to plan for how it would respond to disruptions in power, fuel and food supplies. We can’t rely on FEMA to ride in to the rescue. We can’t afford to entrust our survival to the guys with the biggest guns in our area. The Transition Town movement has it right in their focus on building strong, resilient communities and re-learning valuable pre-industrial skills. But they need a greater sense of urgency. My son’s dream is a warning that we ignore at our peril. There is no time to waste. The Civilization We Grew Up In Is Already Dead. So now what? I can only once again, humbly agree. My own sons grew up relatively non-violent, though their own children still dote on it. We MUST find an alternative! We must give our hearts to it. In no way do I minimize your concerns and the continuum whereby you link violence to the dire realities of climate change. In reading this, your reaction to your son’s dream, I feel exactly the same way about the pervasive and specious use to drugs and alcohol. Binge drinking and “pharm” parties are pervasive. Heroin is a horrifying reality in our little hyper-vigilant, super-PC hamlet. I “see red” at the casual dismissal and normalization of social drinking. Adults sit around the dinner table, “taking the edge off” while the kids are off somewhere playing compulsively on their phones/ipad/wiis. I have a TV to watch movies (and 2 computers, an ipad, a PS and 3 iPhones). The PS games are monitored and fortunately the air soft obsession passed very quickly (after the incident you site). I do not have alcohol or drugs in my house because I don’t want my children or their friends to think I condone their use in any way. I got off anti depressants this year because I want to l live life on life’s terms. Life is hard and sad and deep and I want to be as present as possible. I know that this is a blog about climate change and I know you are not “blaming” any one thing for the dire predicament our earth is in. Oh so true and so powerful, Lorimer! Yes, we are all addicted to fossil fuel and the ease it creates for us. Every time I turn up the thermostat and hear the click and whir of my oil burner coming on to heat the house, I feel a twinge of guilt and self-loathing. Same when I fill up my car at the gas pump. It’s relatively easy to ban weapons or violent video games from one’s home, but we truly sleep with the enemy every single day in this country, because the “enemy” is us–our own culturally conditioned, soft, ease-loving selves. I’m fascinated by this link you’re suggesting between our addictive, consumption-based, instant-gratification society and the predicament our earth is in. Does that mean that the kinds of strategies that work for breaking addictions might also work for getting us to shift, as a society, towards a sustainable relationship with the earth? This is not something I have studied much, but I certainly want to think more about it. One thing for sure, I agree with you that we do need to stay clear-eyed and steady in these crucial years we have left. The hyper-distractions of our society are so much a part of the problem. I so agree with this statement. And yes, we are addicted to fossil fuel and the comfortable ease of our lives. I am as guilty of this as anyone.